In 1984 Eamon Carr, Joe Ambrose & B.P. Fallon (this site needs a Who's Who!) 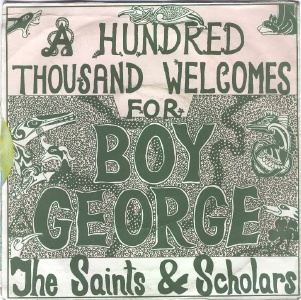 founded The Boy George Welcoming Committee which satirically sought a civic reception in Ireland for the Culture Club singer who was of Irish descent. 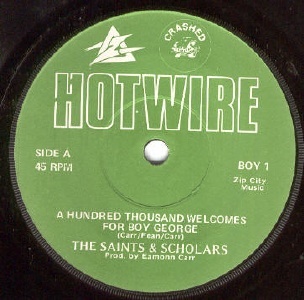 With the help of the Johnny Fean and the Golden Horde, they recorded a single under the name The Saints And Scholars. 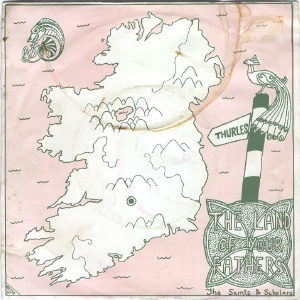 Both sides are jocular folky ballads in the style of The Dubliners. It is now very hard to find. Eamon Carr and Johnny Fean had both been members of Horslips (1972-80 approx) and the Zen Alligators (1980-83). Both sides credited to Eamon Carr & Johnny Fean.